The trailer for the long-awaited multiple superhero movie The Avengers broke records with 13.7 million views in the first 24 hours. That’s a lot of superhero fans! But what’s not to love in this long-awaited action movie that stars everyone from Robert Downey Jr. to Scarlett Johansson? Did we mention Chris Evans, Mark Ruffalo, Chris Hemsworth and Samuel L. Jackson…? In this newly released trailer for The Avengers, fans get a first glimpse, even if it’s only a few seconds, of The Hulk (played by Ruffalo). Green, mean and ready to defend the universe, this is one shirt-busting hero you don’t want to miss. And holy skin-tight-suits, did fans want that glimpse. The newest trailer was released on Wednesday (on leap year, perhaps that was good luck…?) and in the first 24 hours, over 13.7 million fans watched the two-and-a-half minute sneak peek at what is in store for them this spring. Joined of course by the blonde beauty Gwyneth Paltrow, Downey Jr., who reprises his successful Tony Stark/Iron Man character, must help Nick Fury (played by Jackson — love the eye patch!) assemble a team of super humans to form a league of crime fighters known as The Avengers. Why must they band together? Just one of these sassy super humans seems strong enough to match any villain. But there aren’t just any villains in this movie. And not just any plot. 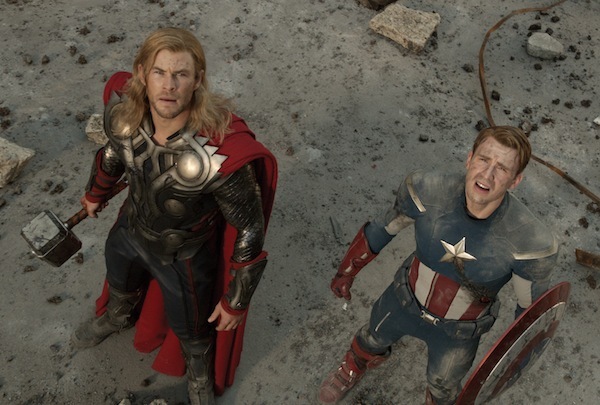 In this episode of The Avengers, the earth is under siege from an evil mastermind named Loki (played by Tom Hiddleston of War Horse and Thor — Hemsworth, do you remember that guy?) and his army of evil-doers. It’s up to our bold band of hot men and one woman — thank you ScarJo — to get the job done, and to show a little bicep along the way. Just saying! Stellan Skarsgard, Jeremy Renner and Cobie Smulders round out the already stellar cast. The Avengers releases in theaters on May 4.